# 0 – Compiler Installation [HD] Views: 6622 | 9:36 min. This is first of the series of tutorials covering the entire course of Programming In C Language. This tutorial basically gets you started by downloading and installing a FREE C/C++ compiler and Integrated Development Environment (IDE) called Dev-C++. This environment will be used in all the subsequent classes in this course. # 1 – Introduction – Part 1 [HD] Views: 4097 | 9:35 min. This tutorial gives an introduction to different types of programming languages. It also covers the definition of Compilers, Interpretors, Assemblers etc. It also creates the very first C Program thereby showing the structure of a simple C Program. # 1 – Introduction – Part 2 [HD] Views: 3446 | 9:10 min. # 2 – Binary Number System – Part 1 [HD] Views: 3050 | 8:43 min. This tutorial covers the binary number system in detail. This is not specific to C Programming Language but it will surely help understand some of the other features of C Programming later in the subsequent classes. # 2 – Binary Number System – Part 2 [HD] Views: 2762 | 8:21 min. [Part 2] This tutorial covers the binary number system in detail. 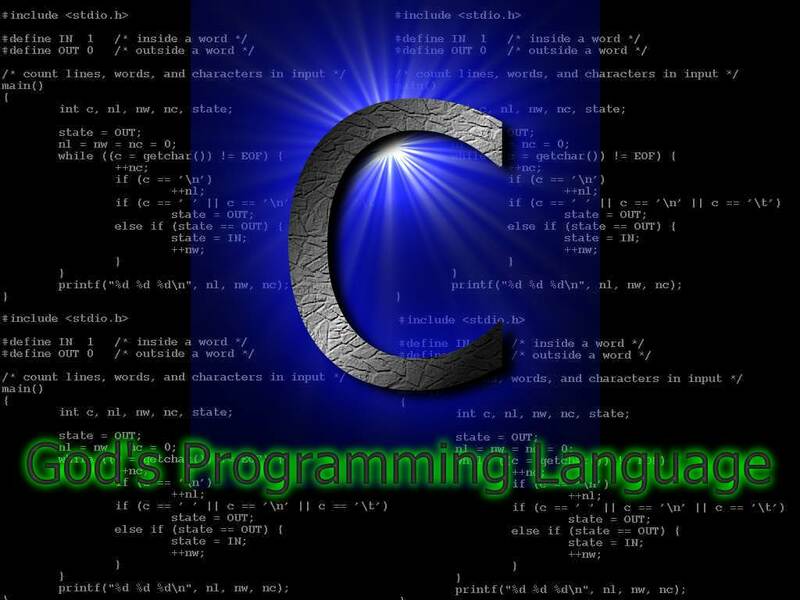 This is not specific to C Programming Language but it will surely help understand some of the other features of C Programming later in the subsequent classes. # 3 – Constants, Variables and Types [HD] Views: 3043 | 8:46 min. In this tutorial we cover some of the basic elements a programming language – constants, variables and types. # 4 – Operators [HD] Views: 2700 | 9:31 min. In this tutorial we cover some of the operators in C.
# 5 – More on Variables [HD] Views: 2162 | 7:40 min. In this tutorial I provide more information on variable declaration and initiation. This tutorial is the continuation of the previous tutorials in which I discuss constants, variables and types. # 6 – Outputting – Part 1 [HD] Views: 2453 | 9:20 min. This tutorial discusses the ways to output messages and variables. # 6 – Outputting – Part 2 [HD] Views: 2017 | 8:58 min. [Part 2]This tutorial discusses the ways to output messages and variables. This is the continuation of the previous tutorial, be sure to watch that one first. # 7 – Inputting – Part 1 [HD] Views: 2267 | 9:32 min. This tutorial discusses ways to input various types of variables. # 7 – Inputting – Part 2 [HD] Views: 1982 | 9:30 min. [Part 2] This tutorial discusses ways to input various types of variables. This is continuation of the previous tutorial so be sure to watch that one first. # 8 – Conditions [HD] Views: 2239 | 9:31 min. This tutorial explains the conditions and relational operators in C.
# 9 – if statement – Part 1 [HD] Views: 2245 | 9:30 min. This tutorial explains the use of conditions in the if statement. # 9 – if statement – Part 2 [HD] Views: 2007 | 8:21 min. [Part2] This tutorial explains the use of conditions in the if statement. # 10 – if-else statement [HD] Views: 1916 | 9:37 min. This tutorial extends the if statement to if-else statement. # 11 – if-else if statement [HD] Views: 2099 | 8:25 min. This tutorial extends the if statement even further to if-else if statement. # 12 – while Loop – Part 1 [HD] Views: 2225 | 8:36 min. This tutorial explains the working of the while loop. # 12 – while Loop – Part 2 [HD] Views: 2008 | 9:43 min. [Part 2] This tutorial explains the working of the while loop. # 13 – for Loop [HD] Views: 2058 | 9:24 min. This tutorial explains the working of the for loop. # 14 – do-while loop – Part 1 [HD] Views: 1869 | 9:22 min. This tutorial describes the working of do-while loop. This tutorial also explains how to choose between different kinds of loops based on your problem. # 14 – do-while loop – Part 2 [HD] Views: 1800 | 9:36 min. [Part 2] This tutorial describes the working of do-while loop. This tutorial also explains how to choose between different kinds of loops based on your problem. # 15 – switch statement – Part 1 [HD] Views: 1993 | 8:53 min. In this tutorial you will learn about the switch statement and how it is used. # 15 – switch statement – Part 2 [HD] Views: 1882 | 9:44 min. [Part 2]In this tutorial you will learn about the switch statement and how it is used. # 16 – Concept of Arrays [HD] Views: 3154 | 7:36 min. This tutorial explains the concept of arrays in programming languages. It also shows how to declare and access the arrays in C.
# 17 – More on Arrays – Part 1 [HD] Views: 2580 | 9:10 min. This tutorial continues to cover arrays in more detail. In this tutorial we write a small program that demonstrates the creation and use of arrays. # 17 – More on Arrays – Part 2 [HD] Views: 2699 | 9:40 min. [Part 2] This tutorial continues to cover arrays in more detail. In this tutorial we write a small program that demonstrates the creation and use of arrays. # 18 – Concept of Strings [HD] Views: 2796 | 9:04 min. In this tutorial we discuss the concept of Strings, how they can be visualized in memory and how they are null terminated. # 19 – More on Strings – Part 1 [HD] Views: 2501 | 9:45 min. In this tutorial we continue to talk about Strings, how they are used in C programming and how they are input and output. # 19 – More on Strings – Part 2 [HD] Views: 2529 | 9:26 min. [Part 2] In this tutorial we continue to talk about Strings, how they are used in C programming and how they are input and output. # 20 – Structures – Part 1 [HD] Views: 3829 | 9:27 min. This tutorial discusses about how to create structures using structs in C. It also talks about how to access the members of a struct. # 20 – Structures – Part 2 [HD] Views: 4386 | 9:34 min. [Part 2] This tutorial discusses about how to create structures using structs in C. It also talks about how to access the members of a struct. # 21 – Concept of Pointers – Part 1 [HD] Views: 3469 | 9:38 min. This tutorial introduces the concept of pointers. It first starts with showing a visualization of the computer memory and how the bytes are addressed. It then explains the concept of pointers and how they are declared in C. It also shows how to assign addresses to the pointers and it also talks about how to access memory locations using pointers. # 21 – Concept of Pointers – Part 2 [HD] Views: 3510 | 9:13 min. [Part 2] This tutorial introduces the concept of pointers. It first starts with showing a visualization of the computer memory and how the bytes are addressed. It then explains the concept of pointers and how they are declared in C. It also shows how to assign addresses to the pointers and it also talks about how to access memory locations using pointers. # 22 – Pointers and Arrays – Part 1 [HD] Views: 3159 | 9:10 min. In this tutorial we learn about the relationship between Arrays and Pointers – how we can use pointers to access the elements of an array. # 22 – Pointers and Arrays – Part 2 [HD] Views: 2664 | 8:52 min. [Part 2] In this tutorial we learn about the relationship between Arrays and Pointers – how we can use pointers to access the elements of an array. # 22 – Pointers and Arrays – Part 3 [HD] Views: 2462 | 9:48 min. [Part 3] In this tutorial we learn about the relationship between Arrays and Pointers – how we can use pointers to access the elements of an array. # 23 – Functions – Part 1 [HD] Views: 2450 | 9:27 min. In this tutorial we learn about defining functions. We write one small function that simply prints a couple of messages on the screen to demonstrate the use of functions. # 23 – Functions – Part 2 [HD] Views: 2675 | 8:40 min. [Part 2] In this tutorial we learn about defining functions. We write one small function that simply prints a couple of messages on the screen to demonstrate the use of functions. # 24 – Function Arguments or Parameters [HD] Views: 2076 | 9:42 min. In this tutorial we learn how to define function arguments or parameters, and how to pass the values to the arguments. We also demonstrate this with an example in which we define a function that adds two numbers and displays the result. # 25 – Returning Values from Functions – Part 1 [HD] Views: 1936 | 9:29 min. In this tutorial we learn to return values from the functions to the caller. We explain it with a simple example of defining a function that squares a given number. # 25 – Returning Values from Functions – Part 2 [HD] Views: 1758 | 8:23 min. [Part 2] In this tutorial we learn to return values from the functions to the caller. We explain it with a simple example of defining a function that squares a given number. # 26 – Passing Pointers to Functions – Part 1 [HD] Views: 1924 | 9:44 min. In this tutorial we learn about how to pass pointers to a function as parameters. This way we can return more than one value from a function. As an example, we learn how to write a function that returns twice and thrice of a given integer. # 26 – Passing Pointers to Functions – Part 2 [HD] Views: 1913 | 9:41 min. # 26 – Passing Pointers to Functions – Part 3 [HD] Views: 1714 | 9:46 min. # 27 – Passing Arrays to Functions – Part 1 [HD] Views: 1885 | 9:54 min. In this tutorial we learn to pass arrays to functions as parameter. We learn that there are two different ways of passing arrays to functions just like we saw before with basic data types. # 27 – Passing Arrays to Functions – Part 2 [HD] Views: 1644 | 9:54 min. [Part 2] In this tutorial we learn to pass arrays to functions as parameter. We learn that there are two different ways of passing arrays to functions just like we saw before with basic data types. # 27 – Passing Arrays to Functions – Part 3 [HD] Views: 1528 | 9:19 min. [Part 3] In this tutorial we learn to pass arrays to functions as parameter. We learn that there are two different ways of passing arrays to functions just like we saw before with basic data types. # 27 – Passing Arrays to Functions – Part 4 [HD] Views: 1499 | 9:57 min. [Part 4] In this tutorial we learn to pass arrays to functions as parameter. We learn that there are two different ways of passing arrays to functions just like we saw before with basic data types. # 27 – Passing Arrays to Functions – Part 5 [HD] Views: 1494 | 5:43 min. [Part 5] In this tutorial we learn to pass arrays to functions as parameter. We learn that there are two different ways of passing arrays to functions just like we saw before with basic data types. # 28 – Stack Explained [HD] Views: 1809 | 9:51 min. In this tutorial we learn about LIFO and FIFO, and the stack. We see how stack is related to function calling, and how the local variables are created on stack and are vanished as soon as the function returns. # 29 – Returning Pointers to Local Variables from Functions – Part 1 [HD] Views: 1430 | 9:30 min. In this tutorial we explain why you cannot return a pointer to local variable from a function. # 29 – Returning Pointers to Local Variables from Functions – Part 2 [HD] Views: 1559 | 9:52 min. [Part 2] In this tutorial we explain why you cannot return a pointer to local variable from a function. # 29 – Returning Pointers to Local Variables from Functions – Part 3 [HD] Views: 1535 | 7:35 min. [Part 3] In this tutorial we explain why you cannot return a pointer to local variable from a function. # 30 – Structures Pointers [HD] Views: 1944 | 9:43 min. In this tutorial we learn how to declare pointers to structures and how to access their members using pointers. # 31 – Passing Structures to Functions [HD] Views: 1650 | 10:04 min. In this tutorial we learn to pass structures to functions by value. # 32 – Passing Structure Pointers to Functions [HD] Views: 1643 | 9:44 min. In this tutorial we learn to pass structures to functions by reference. # 33 – malloc() and free() – Dynamic Memory Allocation – Part 1 [HD] Views: 1879 | 9:31 min. In this tutorial we learn about dynamic memory allocation using malloc(). We also learn about freeing up the dynamically allocated memory. We also see why it is not a good idea to create long local variables since they are created on stack. # 33 – malloc() and free() – Dynamic Memory Allocation – Part 2 [HD] Views: 2248 | 9:43 min. # 34 – Array of Pointers – Part 1 [HD] Views: 1547 | 9:22 min. In this tutorial we learn about the array of pointers. Don’t confuse it with pointer to array. # 34 – Array of Pointers – Part 2 [HD] Views: 1430 | 9:33 min. [Part 2] In this tutorial we learn about the array of pointers. Don’t confuse it with pointer to array. # 35 – 2-Dimensional Arrays – Part 1 [HD] Views: 1468 | 9:35 min. In this tutorial we learn about 2-dimensional arrays – how they look like, how to declare them and how to access the individual elements. # 35 – 2-Dimensional Arrays – Part 2 [HD] Views: 1665 | 9:28 min. [Part 2] In this tutorial we learn about 2-dimensional arrays – how they look like, how to declare them and how to access the individual elements. # 36 – Passing 2-Dimensional Arrays to Functions [HD] Views: 1666 | 9:38 min. In this tutorial we learn how to pass 2-dimensional arrays to functions and how to call such functions. # 37 – Files and Their Types [HD] Views: 1942 | 10:30 min. In this tutorial we learn about files – why they are important. We also learn about the two major types of files – text files and binary files. # 38 – Opening and Closing Files – fopen() and fclose() – Part 1 [HD] Views: 1803 | 9:48 min. In this tutorial we learn how to open a file, check to make sure the file was opened successfully, and then close the file. # 38 – Opening and Closing Files – fopen() and fclose() – Part 2 [HD] Views: 1954 | 9:30 min. [Part 2] In this tutorial we learn how to open a file, check to make sure the file was opened successfully, and then close the file. # 39 – Writing to Files – fprintf() [HD] Views: 1771 | 10:27 min. # 40 – Files – Creating a Simple Database – Part 1 [HD] Views: 1858 | 10:01 min. In this tutorial we learn to create a database. We write a small program which inputs some information about each and every student in a class and dumps that information in a file. # 40 – Files – Creating a Simple Database – Part 2 [HD] Views: 2380 | 10:04 min. # 41 – fscanf() – feof() – Reading From A File – Part 1 [HD] Views: 1933 | 9:47 min. In this tutorial we learn how to read from a file. We also learn how to detect that we have reached the end of file and that there is no more data to read. # 41 – fscanf() – feof() – Reading From A File – Part 2 [HD] Views: 1800 | 10:34 min. [Part 2] In this tutorial we learn how to read from a file. We also learn how to detect that we have reached the end of file and that there is no more data to read. # 42 – fgets() – Reading Strings From A File – Part 1 [HD] Views: 3882 | 9:48 min. # 42 – fgets() – Reading Strings From A File – Part 2 [HD] Views: 1859 | 9:46 min. # 43 – Deleting Data From A File – Algorithm – Part 1 [HD] Views: 2112 | 9:45 min. # 43 – Deleting Data From A File – Algorithm – Part 2 [HD] Views: 1704 | 5:15 min. [Part 2] In this tutorial we are going to learn about an algorithm to delete data from a file. We are trying to keep the code as much portable as possible, and as much simple as possible. # 44 – Deleting Data From A File – Code – Part 1 [HD] Views: 1749 | 10:59 min. # 44 – Deleting Data From A File – Code – Part 2 [HD] Views: 1670 | 9:39 min. [Part 2] In this tutorial we write a program that deletes data from a file. The algorithm to delete the data from a file was covered in the previous tutorial. This tutorial simply implements that algorithm. # 44 – Deleting Data From A File – Code – Part 3 [HD] Views: 3034 | 10:09 min. [Part 3] In this tutorial we write a program that deletes data from a file. The algorithm to delete the data from a file was covered in the previous tutorial. This tutorial simply implements that algorithm. # 45 – Data Structures Concepts And Abstract Data Types (ADT) [HD] Views: 827 | 11:36 min. In this tutorial we learn about the concepts of Abstract Data Type (ADT) and Data Structure, and the difference between the two. # 46 – Data Structures Examples – Arrays – Linked Lists – Trees – Graphs [HD] Views: 1150 | 12:43 min. In this tutorial we talk briefly about different data structures such as arrays, linked lists, trees, graphs, acyclic directed graphs (ADG). # 47 – Disadvantages of an Array [HD] Views: 791 | 14:04 min. In this tutorial we discuss all the disadvantages of using an array in your program. The fact that arrays are fixed size, and the fact that you have to estimate the maximum number of elements, and the fact that insertion of an element in an array is expensive (time consuming), all these make arrays a poor choice in a professional program. C Programming Tutoria Fast Download via Rapidshare Hotfile Fileserve Filesonic Megaupload, C Programming Tutoria Torrents and Emule Download or anything related.